At age 20, Lenelle co-wrote Sexual Dependency, Bolivian director Rodrigo Bellot's feature film debut about Western media influence on the youth of the global south. The film won the International Film Critics' Award at the Locarno International Film Festival (Switzerland) and has since been screened and awarded in dozens of festivals and cinemas on four continents. Lenelle also wrote and starred in Mara Alper's short experimental video To Erzulie which premiered at the Berlin Sommerfest der Literaturen in July 2002. Her self-produced music video Pied Piper was an official selection of the International Museum of Women's 2007 Online Film Festival. Lenelle’s distinct voice is featured in Step by Step: Keeping the Arts Alive, a 30-minute documentary by Julie Akeret. She also earned a vocal coach credit for Through a Lens Darkly, a feature-length film by Thomas Allen Harris. Check out Lenelle’s Vimeo channel for more. Lenelle created the cover art for her book, Haiti Glass. She experiments with collage as a form of meditative practice and nonlinear storytelling. Details of her visual artwork can be found all over this website. Lenelle Moïse is an award-winning poet, playwright, screenwriter, and creative keynote speaker. She performs with theatrical heat, humor, music, and movement. In her book, Haiti Glass, Lenelle writes about around-the-way girlhood, immigration, earthquakes, queer grace, race-relations, guts, love, and memory. She has been a guest artist at the United Nations, Off-Broadway, and at colleges and conferences across North America. Lenelle was a 2017 Massachusetts Cultural Council Artist Fellow in Dramatic Writing, and has penned many plays with leading roles for black women. 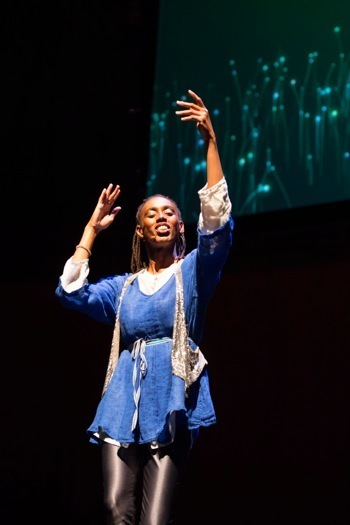 Her solo performances include: Word Life, an acclaimed, interactive coming of age story, Speaking Intersections, a fierce feminist set poetry and prose, and Where There Are Voices, a ritual based on the poems of Haiti Glass. Lenelle independently released two albums: Madivinez and The Expatriate Amplification Project. She leads dynamic workshops on self-expression and social change. She loves rainbows, Nina Simone, quartz crystals, and sequins. She was a Poet Laureate of Northampton, Massachusetts. 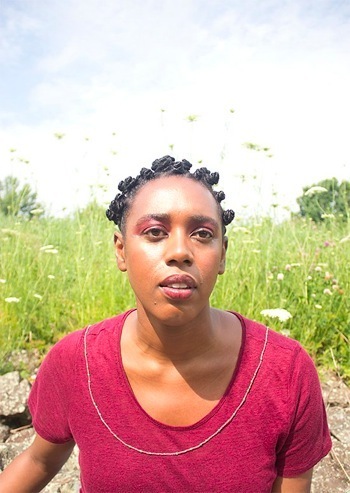 Lenelle was a Huntington Theatre Company Playwriting Fellow, a Next Voices Fellow at New Rep, and a 2018 Playwright-in-Residence at Ithaca College Theatre Arts. Her two-act play, K-I-S-S-I-N-G, was commissioned by the Clark University Theatre Department. Her Ruby Prize winning comedy, Merit, was featured on the 2016 Kilroys List. 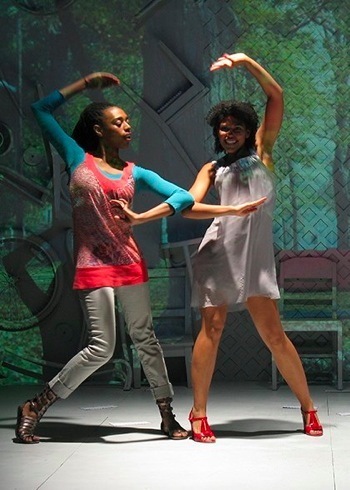 In 2008, the Culture Project launched an Off-Broadway production of Expatriate, Lenelle’s critically-acclaimed two-woman show with all-vocal music (check out the New York Times review). 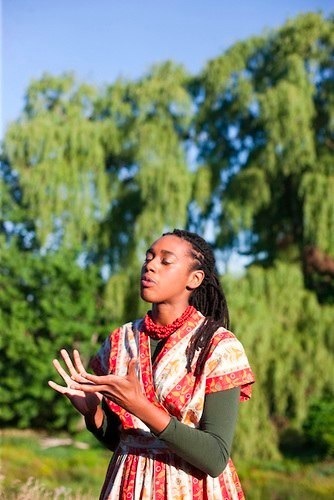 Her other plays include: The Many Faces of Nia, Matermorphosis, Little Griot, Spilling Venus, Cornered in the Dark, and Purple. Lenelle earned an MFA in Playwriting from Smith College. As an actor, she co-stars with Karla Mosley in Expatriate, and appeared in the Off-Broadway production of Rebel Voices, a play based on Howard Zinn’s Voices of a People's History of the United States. Haiti Glass is Lenelle’s debut collection of poetry and prose, and won the PEN Oakland Josephine Miles Literary Award. Her essays are featured in several anthologies, including: Word Warriors: 35 Women Leaders in the Spoken Word Revolution and We Don't Need Another Wave: Dispatches from the Next Generation of Feminists. Her work has also been published in Women and Performance, Meridians, No Tokens, Platte Valley Review, Utne Reader, Make/Shift Magazine, Left Turn, Rethinking Schools, and Velvetpark Magazine, among others. Lenelle was a featured writer for the Institute for the Future of the Book’s The Golden Notebook Project. love song, part battle cry. to your campus or arts venue.